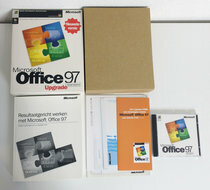 Microsoft Office 97 Standard Upgrade Dutch on PC CD-ROM. 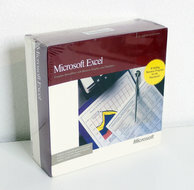 Authentic Microsoft Office 97 Standard Upgrade package. Microsoft Office 97 is a major milestone release of Microsoft Office, which includes hundreds of new features and improvements over its predecessor. It introduced "Command Bars", a paradigm in which menus and toolbars were made more similar in capability and visual design. It also features natural language systems and sophisticated grammar checking. Documentation and software in Dutch. Complete set on CD-ROM with product key on jewel case. 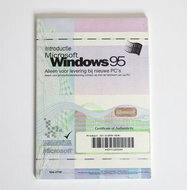 - Microsoft Office 97 Standard Upgrade registration card, terms & conditions etc.